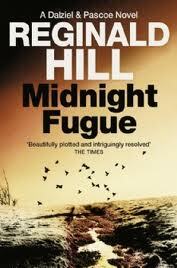 My review of Midnight Fugue by Reg Hill is up on the Celebrating Reg Hill site. In Mid-Yorkshire, Detective Superintendent Andy Dalziel is not quite himself, still easing himself back into work after being hospitalised by a terrorist bomb. His Monday morning starts badly when, seemingly late for work, he discovers that it’s actually Sunday. To make matters worse he’s been followed by a woman chasing a ghost – her former copper husband who disappeared seven years previously after the death of their daughter and accusations he was on the take. She in turn is being followed by a sister and brother pairing, sent to dispose of the rogue cop before he turns against the criminal he served. That criminal is Goldie Gidman, who started running rackets, progressed into the money markets of London’s square mile, and is now a major conservative party funder. His son is a MP and a rising star of the party. Both are being hounded by a tabloid journalist, the nephew of a cop who failed to corner Gidman for the murder of a local Polish businessman. A recent picture of the rogue cop, taken in Yorkshire, has been sent to his former wife and she wants Dalziel to help find him so she can get divorced and marry one of his former colleagues, one of Dalziel’s old copper mates. So starts a sixteen hour swirl of drama and farce. Midnight Fugue is the twenty-second Dalziel and Pascoe book. The series has lost none of freshness, wit and verve. The story starts at a brisk pace and never lets up to the end. There are three main strengths to the book. First, the characterisation is excellent, and despite there being a large cast, each character is fully fleshed out and realised. Dalziel is a wonderful creation, possessing a number of negative traits, yet the reader can’t help but warm to his political incorrectness and bullying manner due to his generally good disposition. Second, the plotting, whilst quite complex and intricate, involving the intersection of several subplots, is very well done. Hill weaves the various strands together, whilst making sure the reader never gets lost, and there are two nice climaxes to the tale. It’s always difficult to avoid plot devices and the only let down to the telling were the use of two weak ones – both involving laptops and neither likely. 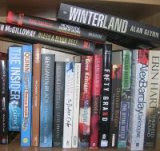 Third, the storytelling and prose has verve and style. Hill manages to blend a serious crime story with farce, balancing seriousness with wit. It’s a difficult trick and he manages to pull it off with aplomb. And whilst the telling is so rich in detail and the plot reasonably complex, this is no doorstop of a book, and yet it does not seem rushed. The overall effect is a very enjoyable police procedural written by an author at the top of his game. Rob - It's a fine review and we appreciate your excellent contribution! !